Personal Protection Tip: Install a quality heavy duty deadbolt lock with a good faceplate on your exterior doors. 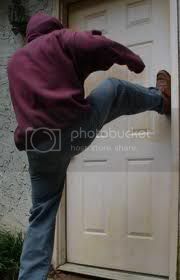 The average exterior door has a lock that can be kicked in by your average home-invader who has no qualms about coming into your home even if you are there. A good lock can slow him down enough for you to have time to execute your personal protection plan.